I looked back at my Jan. 15 shots and noticed I had taken about a thousand frames that day. Usually when I shoot that many frames in an outing it indicates that the wildlife activity was pretty good that day. So I went through all the shots and tried to come up with ones that would give my readers an accurate account of how my day went. I even have a couple of videos that aren’t exactly exciting but add a little bit of variety to the post. So we’ll step back a few months in time and re-visit wildlife in winter. I’m trying a new format this time where I display large images in the blog post rather than a thumbnail that you have to click on to see the image properly. Hopefully, this is a little more convenient and will ensure that folks are viewing a large version of each shot. One problem with this new format is that the sidebar covers part of the first 4 photos. Please click once on these (or any) images and they will display in full without the sidebar. Grab your favorite beverage because there are a lot of images here. Ok, let’s get out onto the 4-mile gravel auto tour route at the Ridgefield NWR, Jan. 15, 2014. I have my camera at the ready, snacks and drinks on the floor in a bag, and both windows of the truck wide open for quick shooting access. Oh, and don’t forget that the truck heater is on full blast to attempt to take the chill off. Driving through the Ash tree forest portion of the route, here’s a shot of a raccoon that had crawled up in a hollow tree stump. On March 16, I posted a photo of a Barn Owl in this exact same location. Next is a video of a Double-crested Cormorant drying its wings near marker #10. Best viewed at 1080p resolution in full screen. 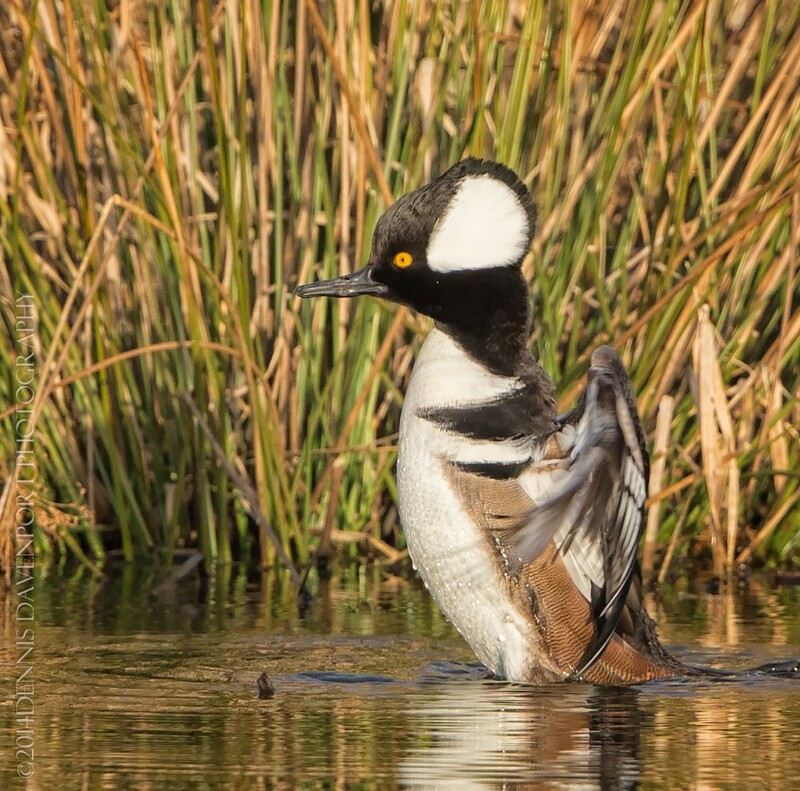 Here’s a video of this Hooded Merganser doing some preening. Best viewed at 1080p resolution in full screen. These last 27 images were all taken from my truck in the same spot in just over an hour–eleven different species either flew by or swam by. The light was right so I just waited for birds to come to me. A fun way to end a photo shoot at the refuge. Check ’em out below! Our friend, the Hooded Merganser, gave me a wing flap so here are 4 of the frames from that burst. Canon 5D Mark III, 1/1600, f6.3, ISO 800, 700mm. (3:36 p.m.) I think I like the last one best. This entry was posted on Sunday, April 27th, 2014 at 2:51 am and is filed under The Blog. You can follow any responses to this entry through the RSS 2.0 feed. You can leave a response, or trackback from your own site. WOW! Thanks for those amazing photographs!!!! Breath-takingly amazing!! Thank you, Christy, for your nice words! It makes me happy that you enjoy them, which is what it’s all about.